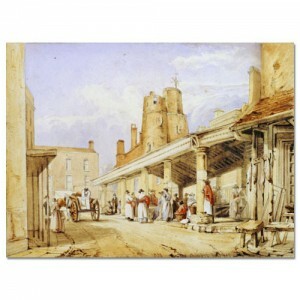 This watercolour on paper by the Reverend Calvert Richard Jones of the ‘Old Market, Swansea’ was produced in 1830. It would appear to have been inspired by an engraving by Stockdale/Storer produced in 1824. This watercolour may have been created in recognition of the market that replaced it, which opened in 1830 on land given to Swansea by the artist’s father, also Calvert Richard Jones. This work also warrants comparison with John Nixon’s painting of Swansea Market Square produced in 1799, now at the British Museum it depicts a similar scene but altogether busier. It is more detailed, a more lurid, perhaps, more honest look at eighteenth century life in commercial Swansea.